We are please to release the 120th (February 2017) edition of ezine: PreSense announces the 8th Edition of Sansad Ratna Awards to be held at IIT Madras on Saturday the 27th May 2017. In this edition, we also announce the rules for Sansad Ratna Awards. Sansad Ratna Awards is one of the initiatives of this ezine PreSense to honour the outstanding Indian Parliamentarians. 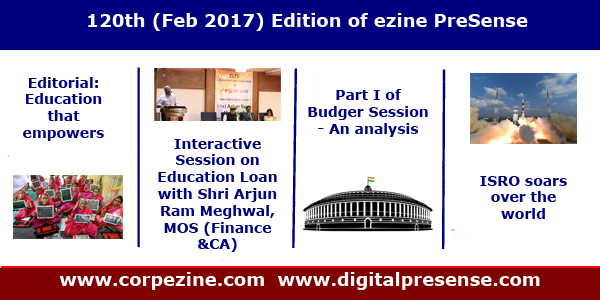 Nation: K. Srinivasan, Editor in Chief, analyses the performance of MPs till the end of Part I of Budget Session of Parliament. Ignited Minds I - Dr Jagannathan, Editorial Advior writes on the success story of ISRO after the recent launch of 104 satellites. Ignited Minds I - Susan Koshy, Editor interviews Dr Agarwal, Science and Technology Advisor to Former President Clinton on 'empowering girl child in rural India'. Snippet : Sukruti Narayanan, Editorial Team, writes on Oscar Awards. Cartoon : Triambak's usual Prince cartoon. We are confident that our readers will enjoy this edition of ezine too. Please send us your valuable feedback to us at editor@corpezine.com. Please also share this ezine with your friends.